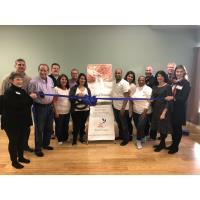 “We are a family-owned and operated business that provides a calm and relaxed environment to encourage a feeling of peace and positivity using natural methods,” said owner Nina Newcombe. Natural Serenity’s services include Halotherapy (Salt Room), Yoga, Ionic Foot Detox and Aromatouch. They also carry a line of all-natural body products. Ribbon cutting attendees included (l-r): Gaye Mack (Gaye F. Mack, Inc.), Enrique Vasquez (CareBuilders at Home), Steve Warren (Barrington Exterminating Co.), Dennis Kelly (FGMK Insurance Agency, Inc.), Hope Cantu (Natural Serenity), Norman May (Full Service Office Solutions, Inc.), Nina and Rondell Newcombe, Melinda Padilla and Peggy Ayers (Natural Serenity), Scott Felgenhauer from Plaidypus, Inc., Karen Darch and Jeff Lawler (Village of Barrington), and Martha Goodman Stack (Wells Fargo Advisors).